The fuel-injected 376cc four-stroke, four-valve engine produces efficient power and driveablity. Suzuki's class-leading fuel injection smooth’s power output, especially in the mid-to-high range, and provides excellent cold starting. The system uses 3-D maps for optimum ignition, creating responsive yet environmentally compliant performance. Suzuki Advanced Cooling System (SACS) uses an oil cooler and thermostat-controlled cooling fan to shed engine heat during hard work or cargo hauling. Push-button electric starting has a start-in-gear function allowing starting without shifting to neutral (as conditions permit). The Quadmatic™ transmission is a fully automatic, CVT (Continuously Variable Transmission) with selectable high-low sub-transmission and reverse for maximum traction and fuel efficiency. Automotive gate-type gearshift lever lets you conveniently choose high- or low-range, neutral or reverse. Select two- or four-wheel drive with the flip of a handlebar-mounted lever. The shaft drive system is reliable and durable, and is nearly maintenance-free. An advanced engine-braking system minimizes free-wheeling with the throttle off to help control the ATV during steep descents. Suzuki's plush T-shaped seat delivers rider mobility during sport or difficult terrain riding. Overall length is under 82 inches (208 cm) so the KingQuad fits into a 6.5-foot truck bed for easy transportation. Independent front A-arm suspension offers smooth performance and remarkable ground clearance with 6.7 inches (170.1 mm) of wheel travel. A swingarm rear-suspension with 6.7 inches (170.1 mm) of wheel travel and twin shock absorbers provides agile handling and plush ride. Dual front hydraulic disc brakes feature calipers with large 34mm pistons and wide brake-pad surface area for increased stopping power and outstanding durability. Large, 25-inch CARLISLE tires with aggressive tread offers consistent traction in wet conditions, yet has a quiet, smooth ride on hard-packed trails. Lightweight and strong plastic skid plates, sturdy to withstand trail pounding yet slippery to let obstacles slide below. Heavy-duty front and rear cargo racks let you take advantage of the ATV’s superb load capabilities. Wrinkle paint finish on the racks and front bumper is durable and scratch resistance. LCD instrumentation includes speedometer, odometer, tripmeter, hour meter, clock, fuel gauge and indicators for reverse, neutral, oil and FI. Automotive-style DC power outlet on front fender. Large 4.2-gallon (15.9 L) fuel tank provides outstanding riding range. 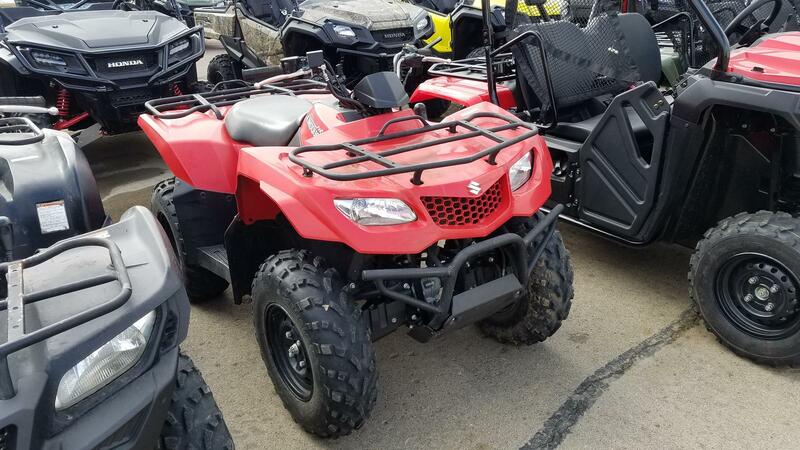 A variety of Suzuki Genuine Accessories are available, including winches, windshield, front and rear bumpers, snow plow, aluminum skid pans, rack extensions, utility box and more. Minimum Operator Age: 16 Years Old. Suzuki ATVs may be used only by those aged 16 and older. Suzuki highly recommends that all ATV riders take a training course. We’ll even pay for it. For safety and training course information, see your dealer or call the SVIA at 1-800-852-5344. ATVs can be hazardous to operate. Always avoid paved surfaces. Never ride on public roads. Never carry passengers or engage in stunt riding. Avoid excessive speeds. Be extra careful on difficult terrain.